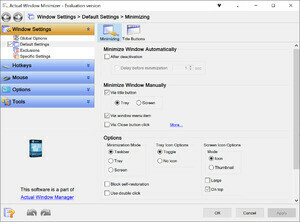 Actual Window Minimizer lets you minimize windows to the system tray or any desktop spot by various means. This currently includes the Minimize-to-Tray button in window's title bar, hotkey use and automatic minimization upon window startup or deactivation. Also you can set default (Minimize or Close) buttons to minimize a window to tray. All these features let you organize your workspace with ease. Actual Window Minimizer 8.13.3 is a shareware program and can be used as a demo to try the software until the free trial period has ended. A full version of the program is available after the trial period ends. For security reasons, you should also check out the Actual Window Minimizer download at LO4D.com which includes virus and malware tests. Additional screenshots of this application download may be available, too. Actual Window Minimizer download been highly rated by our users.